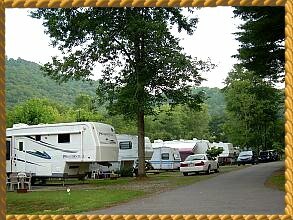 Spacious Sites which can accommodate anything from Tents to 45' RV's with Full Hook-up or just Electric & Water. We have a couple new 50 amp sites. We've also added 4 Satellite Stations, so there is now TV throughout the Park. Everyone is welcome to include Singles, Couples, Families, Groups, and YES Pets too! We have rates for Daily, Weekly, Monthly, 7 Month Seasonal, Extended Season, and Year Round Residents. Your hosts - Lou, Pat, Danielle and the "Four Legged Kids" will welcome you and help you enjoy your stay!!! Christmas is Special at the Pines too! We have Lots of Lights, Blow-ups, Decorated Christmas Trees, Sculptures and other Decorations throughout the Park. Just like being Home for the Holidays !! 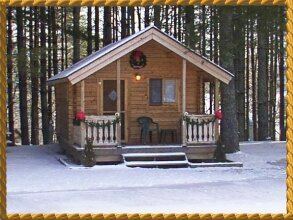 We have 2 of these charming one bedroom Log Cabins, the "Moose Lodge and the "Bear's Den". Each of them features a rear bedroom, bathroom, fully equipped kitchen, and living room with TV and DVD Player. They are both Air Conditioned and Heated. 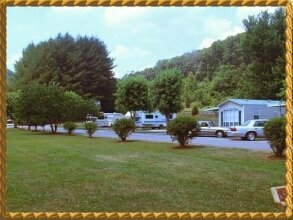 They have a spacious front porch for sitting, relaxing and taking in the view of our lovely park grounds. They can each sleep up to 5 people. 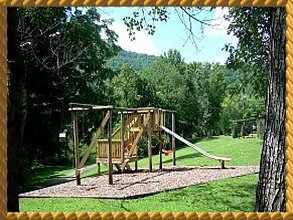 For Your convenience there is a Fire Ring, Picnic Table and a Double Seat Swing at the Cabins. Both of our Cabins are Pet Friendly. We also now have a nice rental Park Model (where we do not allow Furry Friends) Please call for information on this rental. 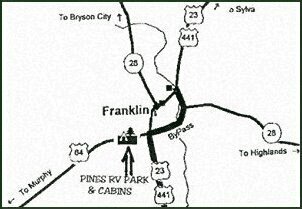 Please call or email us for more detailed information on our Park and Services.